20/01/1996: Recording at Milo (Studio 2) of the Casanova album. • Following a football accident during which both his arms are broken, Grant Gordon lets his place as a drummer to Miggy Barradas: “I broke my elbow playing football just as the gigs of Summer ’96 were kicking off. Miggy was brought into cover me, but realistically I couldn’t play drums for 3 months or so. So that was that! By the way Miggy’s a very nice guy and a terrific drummer!” However, he keeps on playing with the band as a percussionist and a choir singer during the band’s audio-visual appearances before leaving them. At the same period, Ivor Talbot, of the road crew, joins The Divine Comedy as a full-time guitarist. 15/04/1996: French release of Casanova. 29/04/1996: Casanova album released on Setanta Records. 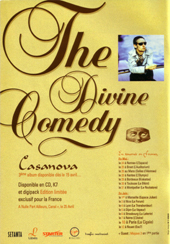 • The Divine Comedy start touring in France. The tour is scheduled as part of the ‘L’Imaginaire Irlandais’ festival, year of the Ireland in France. 17/06/1996: Something For The Weekend released. 23/06/1996: Something For The Weekend rises to No. 13 in the charts due largely to the efforts of Chris Evans who makes the track his 'breakfast biggie'. 26/06/1996: The band spend the night dancing in Lily's Bordello, Dublin, and later riding through the city in a horse-drawn carriage having consumed a lot of alcohol. 01/07/1996: Setanta Records re-release the Casanova album. 08/07/1996: Setanta Records re-release the Liberation and Promenade albums. 07/1996: Recording in Paris of 'Comme Beaucoup De Messieurs' with Valérie Lemercier. The single will be released in September. 12/08/1996: Becoming More Like Alfie released. 18/08/1996: Becoming More Like Alfie enters UK charts at No.28. 08/1996: Rehearsals session at September Sounds, London. 06/09/1996: Neil Hannon is in New York City to promote the U.S. release of Casanova by Setanta U.S.. Kevin Westenberg happens to be in New York at the same time, so Keith Cullen arranges a meeting between them and they shoot the A Short Album About Love pictures near the Guggenheim museum. • The Divine Comedy tour in England, then in France to promote the release of the third Casanova single The Frog Princess. 19/10/1996: Soundchecks and rehearsals at the Shepherd's Bush Empire with the Brunel Ensemble. The album A Short Album About Love is recorded over two days during the soundchecks and rehearsals. 04/11/1996: The Frog Princess released. 10/11/1996: The Frog Princess enters UK charts at No.15. 23/11/1996: The Divine Comedy review this week's single releases in Melody Maker. • The Divine Comedy tours in Europe (mainly Germany) and in the U.S.A.
12/1996: Neil Hannon and Joby Talbot set on an acoustic tour in the States. 21/12/1996: In the NME Writers Top 50 Casanova is No. 19 while in Melody Maker 'Album of the Year' chart it is No. 40. 12/1996: Neil grows a beard.